The ERSA Multitip series covers a wide range of applications. 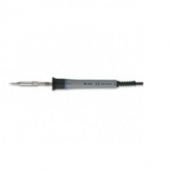 It stands out by its low weight and compact design (short distance between soldering tip and the handle´s front part). The handle stays relatively cool while soldering. The Multitip is available for 15 and 25 W and suitable for both micro-soldering joints and medium-sized soldering, as on distributor strips. Long-life and industrially tested PTC heating elements and internally heated soldering tips provide high efficiency and fast heat supply. Complete with ERSADUR-Long-life soldering tip (0172BD) and holder (0A18).